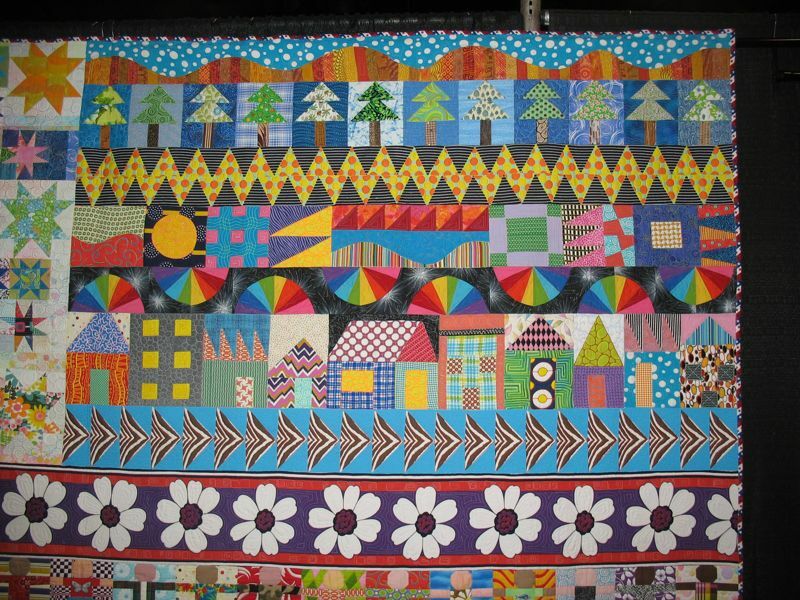 Road to California 2010 | OccasionalPiece--Quilt! 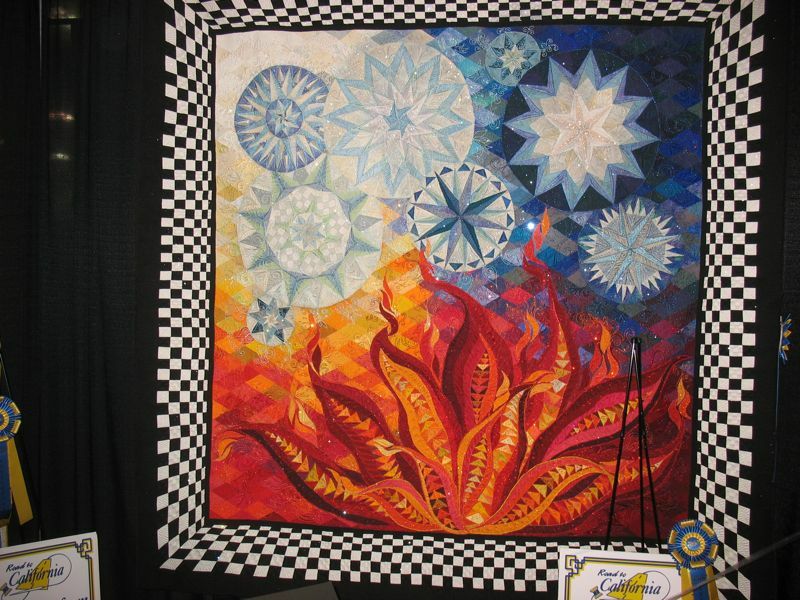 Posted on February 3, 2010 by Elizabeth E.
This was my tenth appearance at the Road to California Quilt Show, held in Ontario California. I have entered in the past, but haven’t since grad school, lacking either the time or the interest. But there’s also this nagging suspicion that my quilts may not measure up, given the direction that quilting seems to be going. So when I come to the show, I come with a critical eye, trying to identify trends. Or fads (such as crystals). One trend is in the quilting. 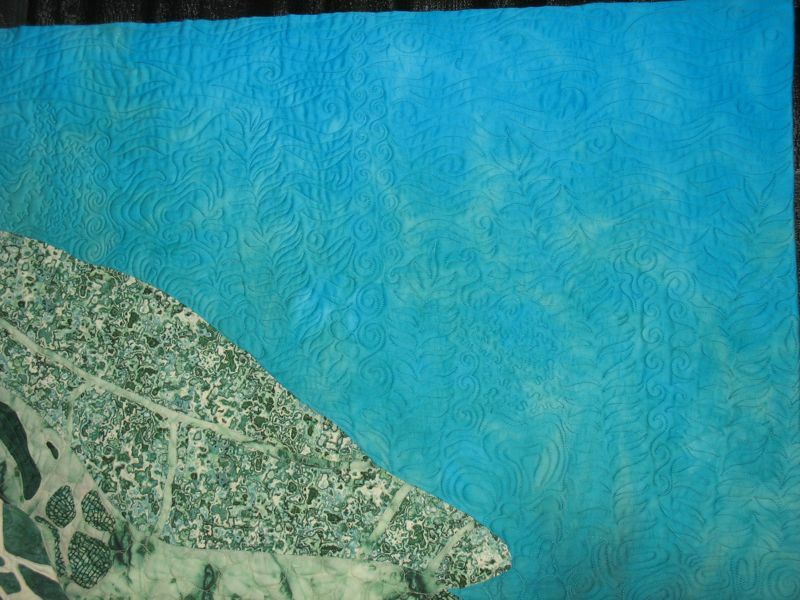 Not just the single line of thread tracing around a patch or creating a feather, but Quilting As The Star. 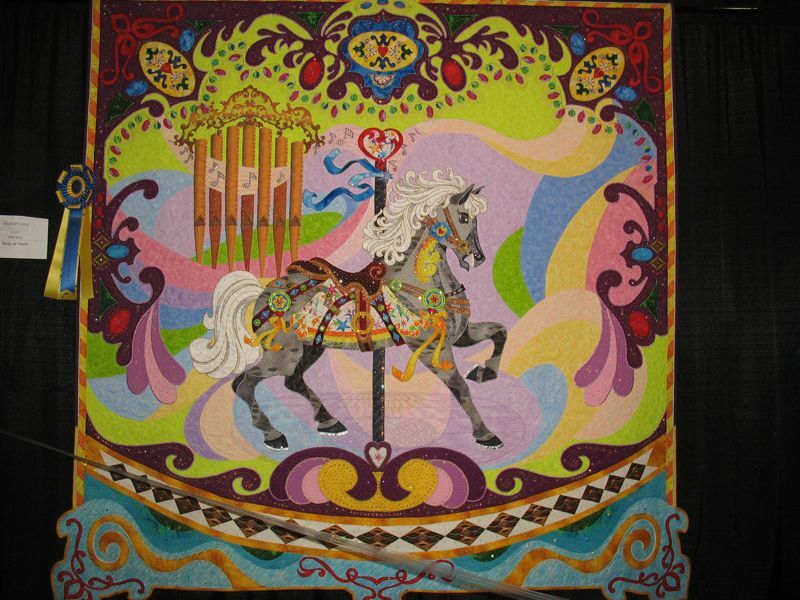 This quilt typifies that, with its narrowly spaced lines of thread (don’t even get me started on why we quilters need to use certain types of thread), decorative jewels, sequins, crystals adding to the main pieced design. 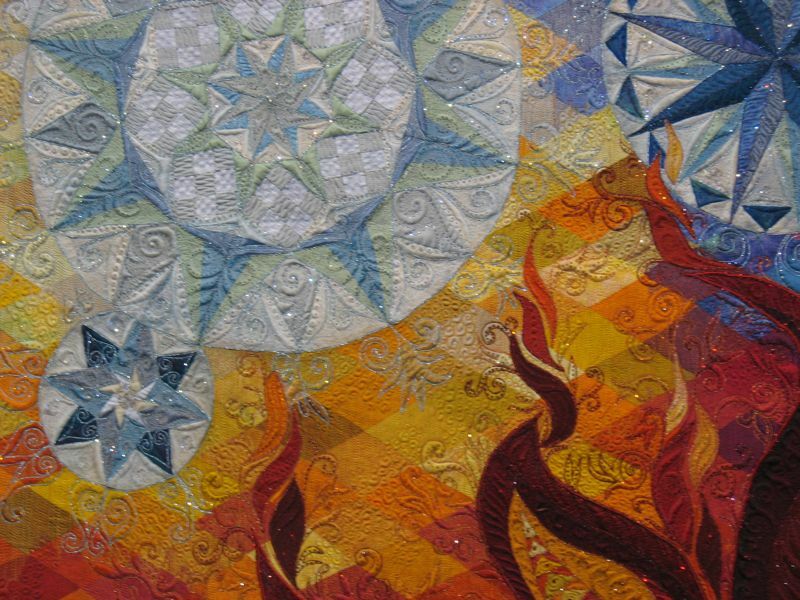 There are quilted flames shooting off the appliqued fabric flames, and tightly scrolled quilting suppressing certain areas of the quilt in order to create a sort of trapunto effect. 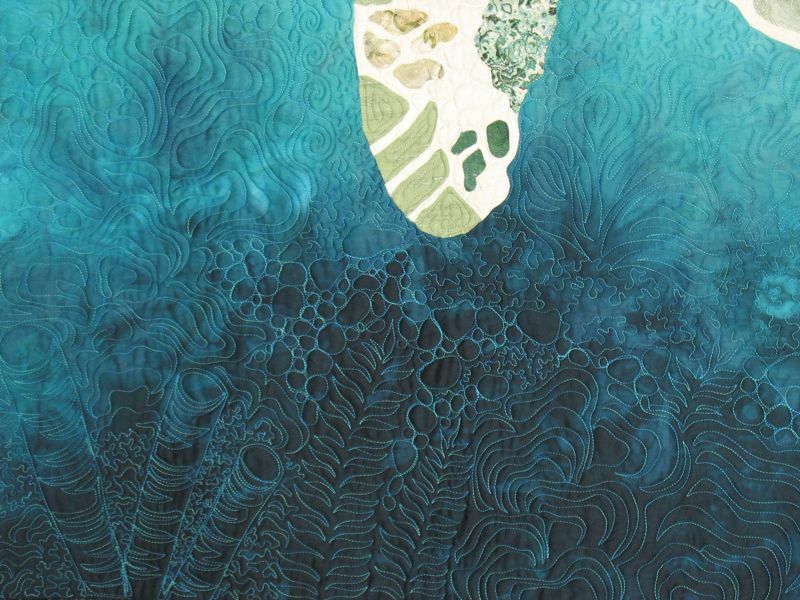 The whole quilt is layer upon layer on texture, color, design. 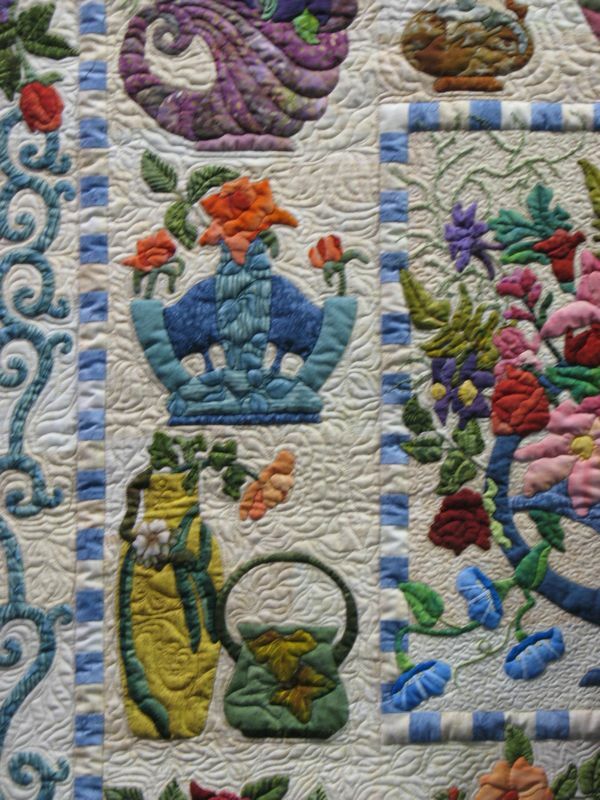 I think that was the year that two quilts were exhibited at the back of the hall, covered in heavily quilted design and crystals for accent. Multi-colored threads outlined feathers, swirls, circles, and a dragon (if I remember correctly). We were in awe. We all had a crush on this new boy in town. Now the heavily quilted are at the front of the hall, strutting their stuff and this influence has had some unfortunate effects, I think. Case in point is the quilt below. 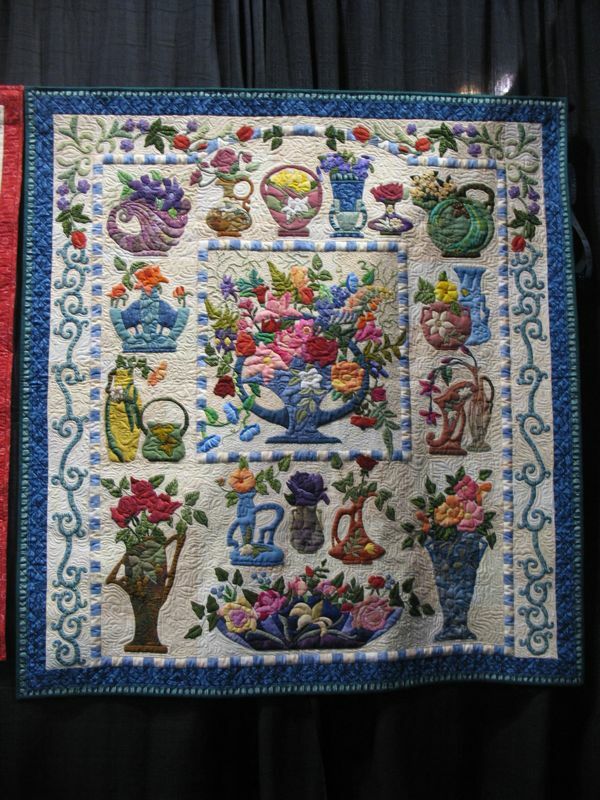 In this first picture, the appliqued vases and flowers of baskets have the full stage, but upon closer inspection. . .
. . . the quilting obscures the images, even competing for attention. 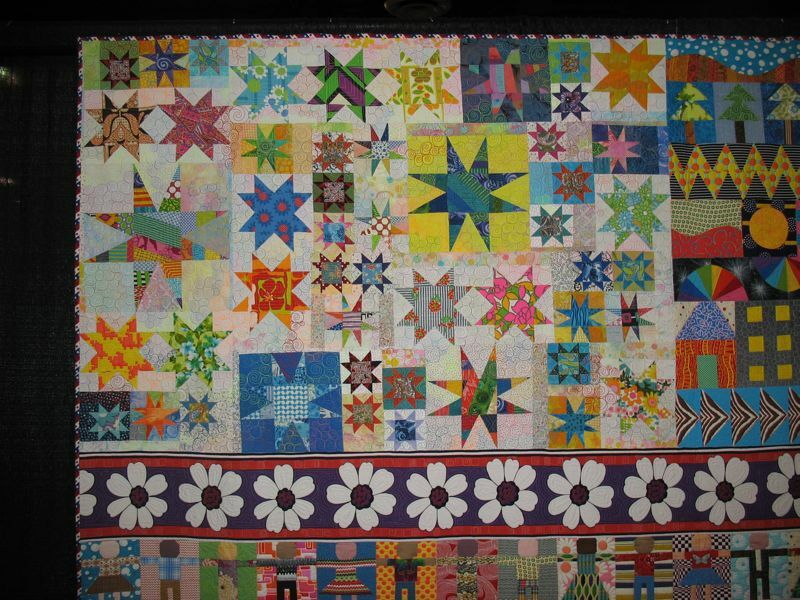 I found this to be sad, as the handiwork done by the quilter was beautiful and precise, but the quilt was marred by the quilting–lots of quilting–in between each petal and flower. 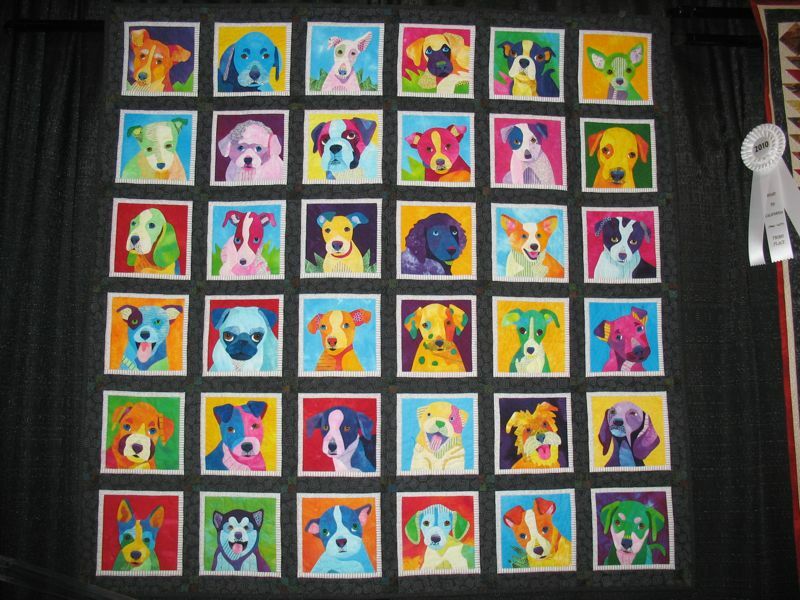 I think a simple gridded design in the background would have served the quilt much better. This quilt gets the balance correct. 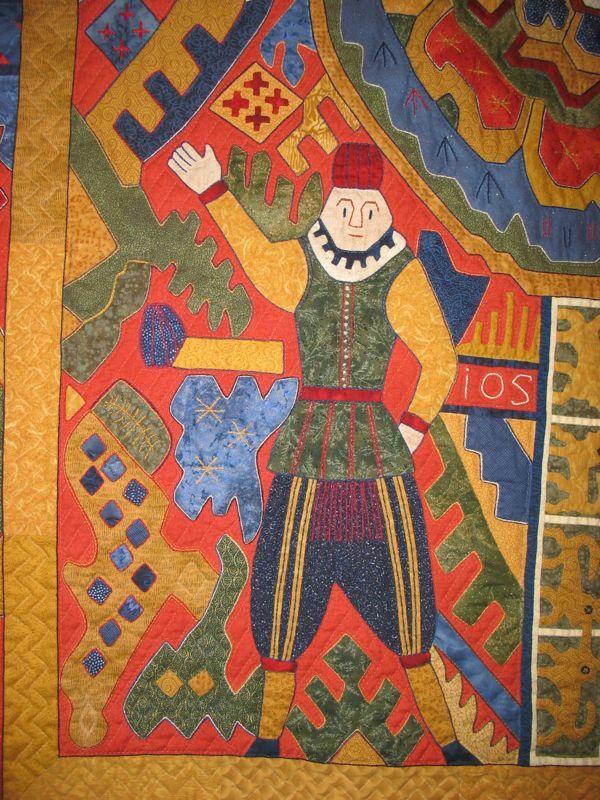 Suzanne Marshall writes that her “quilt is adapted from a 17th century Norwegian tapestry that depicts the Legend of Guimar, the knight who shot a deer but whose arrow returned to injure the hunter.” The entire quilt is show below. 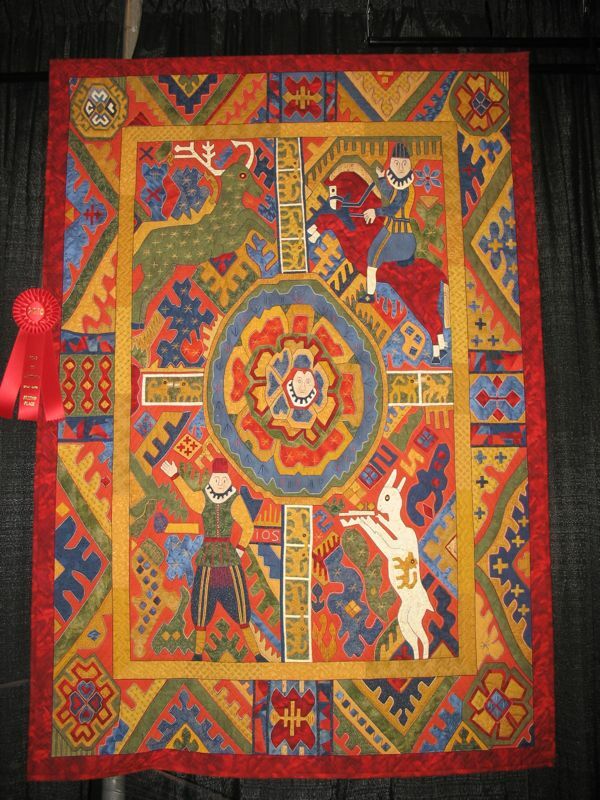 Every quilt show has its Ugly Quilt and I found this year’s. It was in a group exhibit (otherwise I’m sure it would not have gotten in). 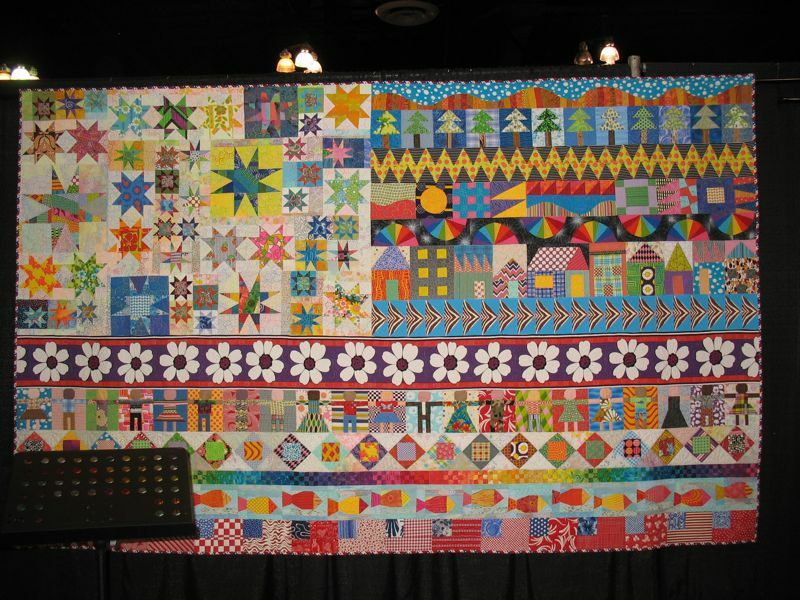 Nearly every element has gone awry–from the choice of color and the applique technique to the quilting, which again, is too much, much too much, obscuring what little there might have been to redeem this sad quilt. 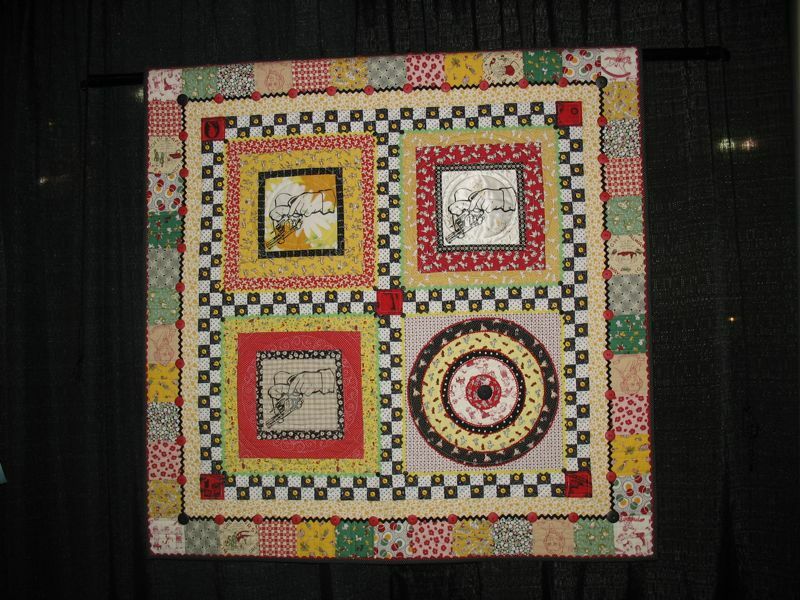 I admit I have a few pieces which might qualify for this honor–all quilters do. 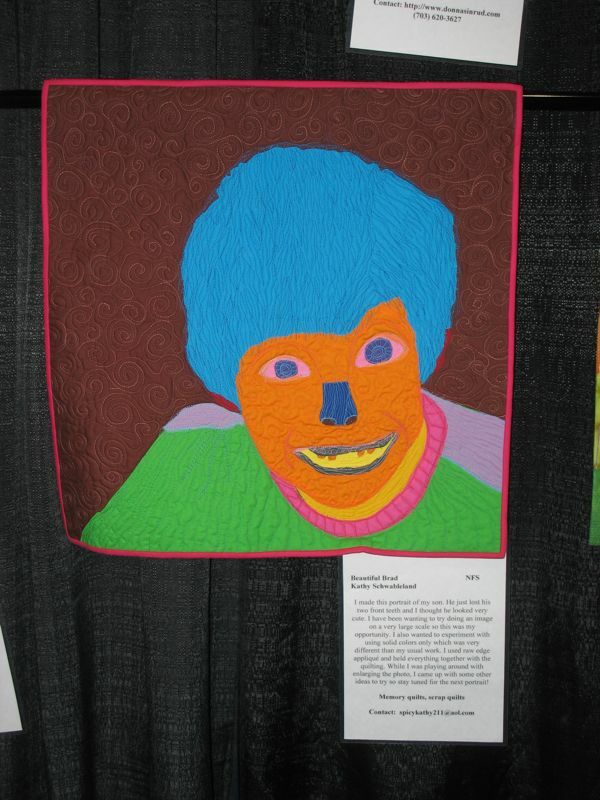 Even though this one has won top awards, I think it also qualifies in my book as one of the candidates for the Ugly Quilt. 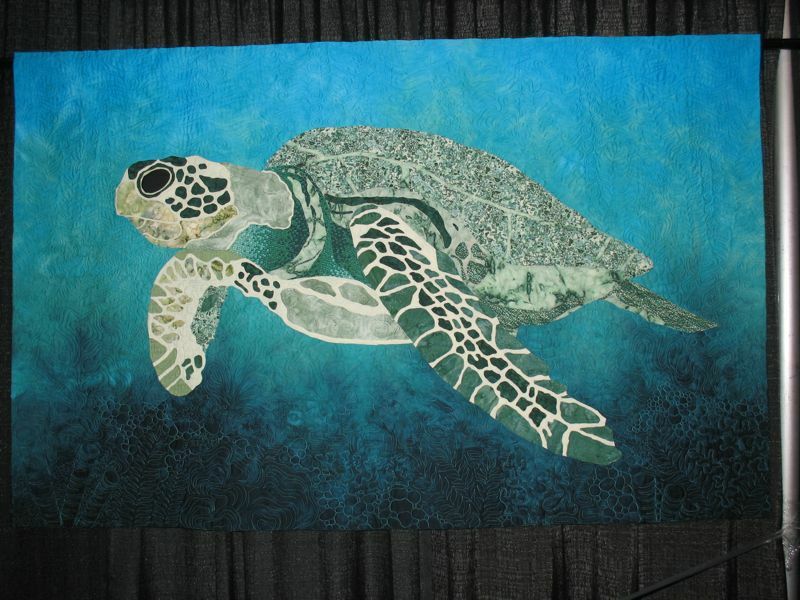 The quilting really works in this quilt, and it is used to bring out the texture of the turtle and the motion of the water. 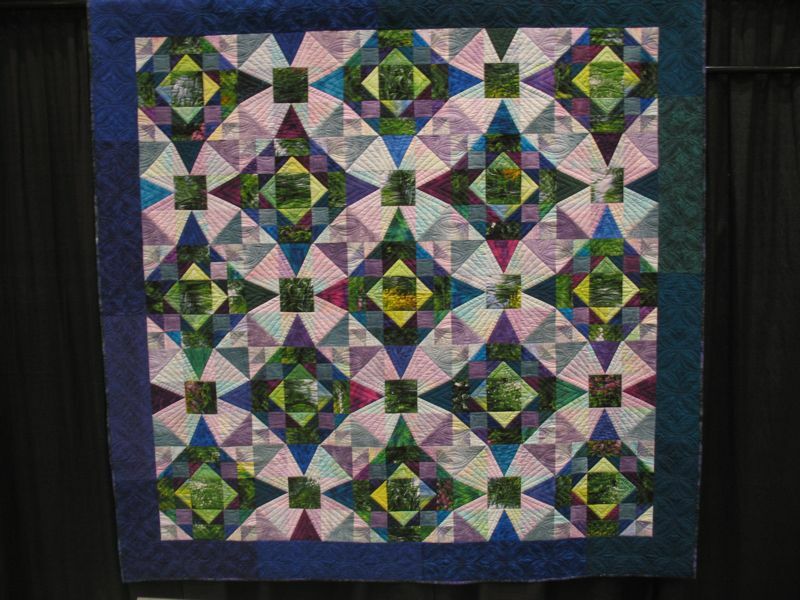 The quilting complements what is going on in the design, instead of competing or obscuring it. Here are some that caught my (untrained) eye. 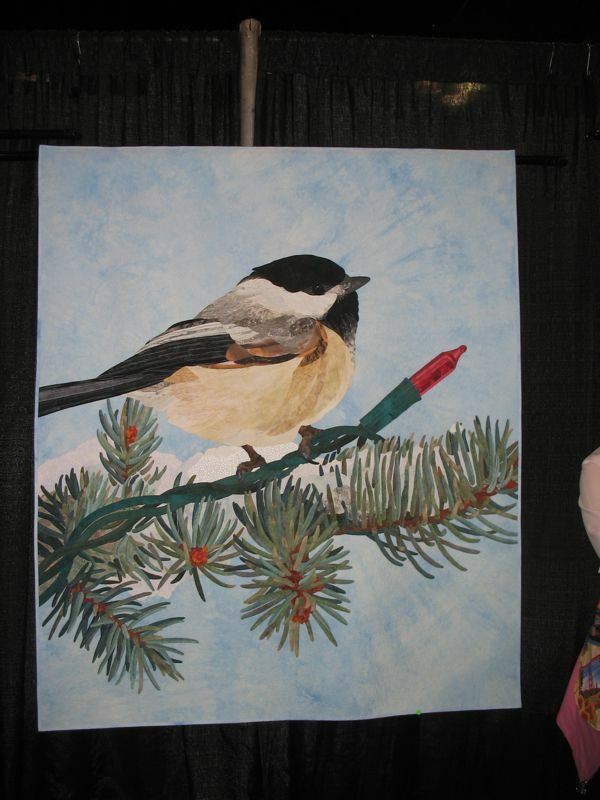 The inclusion of the Christmas tree light elevates it from a simple nature scene into a conversation. 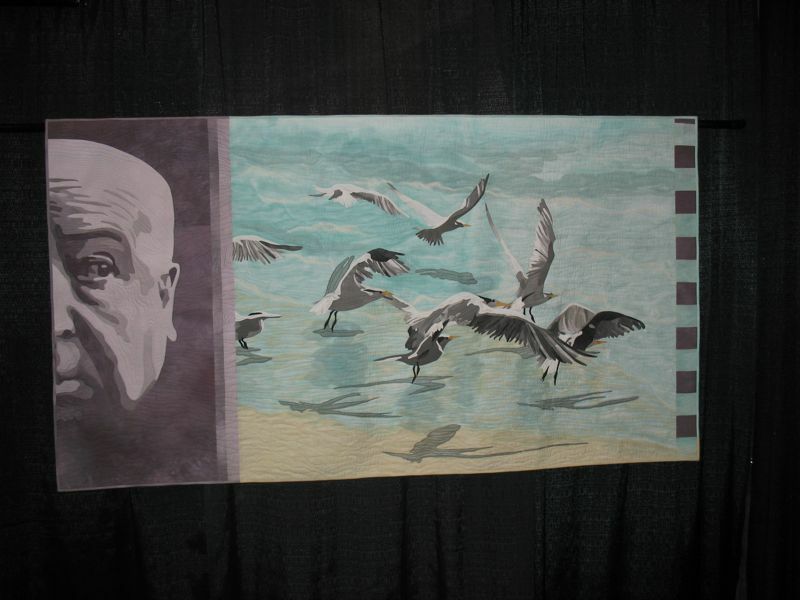 Hitchcock keeping an eye on these birds was what pulled me in, but I also liked the reference to the film by the inclusion of “sprocket holes” on the side of the quilt. Joen Wolfrom’s quilt works well on so many levels. It’s the first I’ve seen of hers in many years. 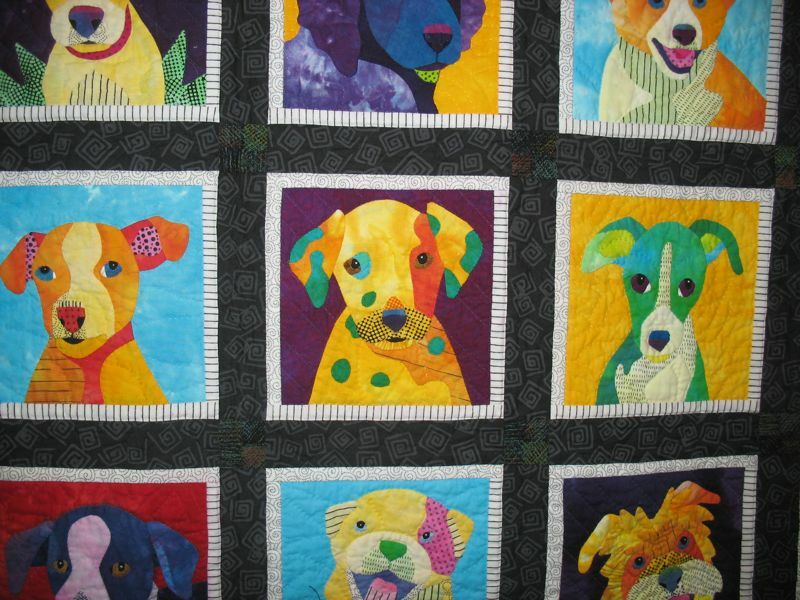 She’d stopped quilting for a while when her hand was injured in a dog attack. 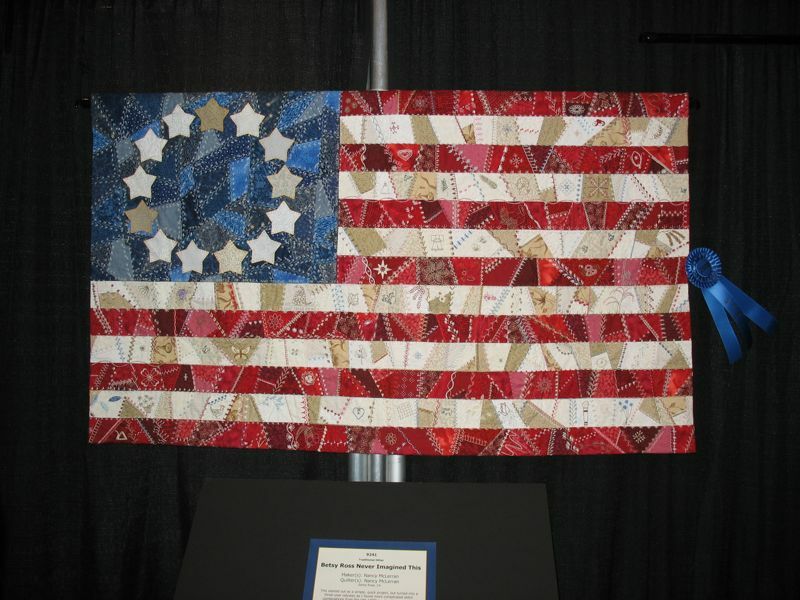 Great use of quilting blocks and traditional motifs to create a flag. 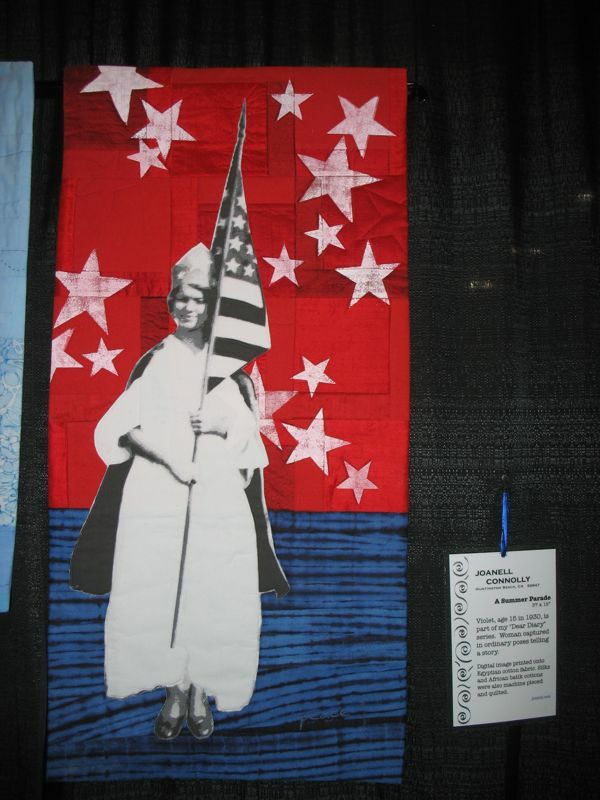 Depictions of the flag in red, white and blue are found a lot at quilt shows (we’re a patriotic bunch, I guess) but this one, with its brights and bolds was a real stunner. It’s huge, probably 9 feet long by 5 feet tall. 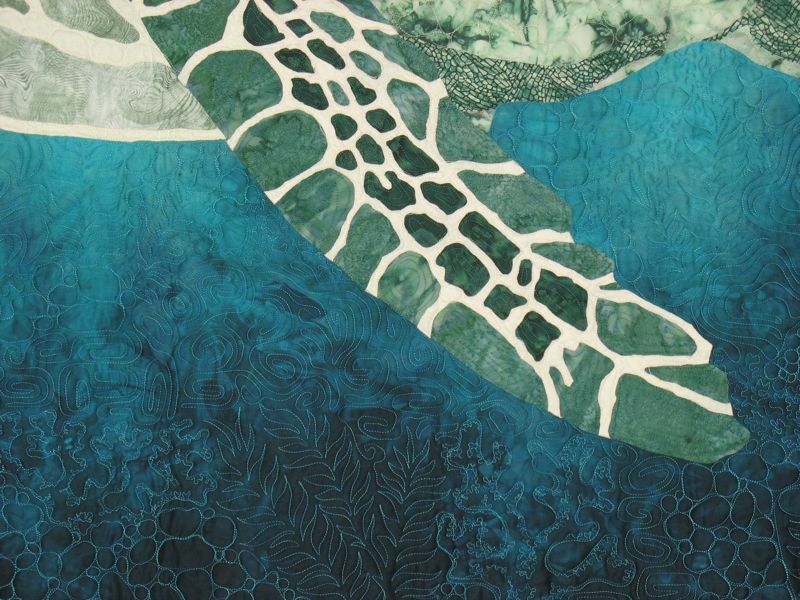 Love the paper doll blocks, swimming fish, flags–this quilt has everything! 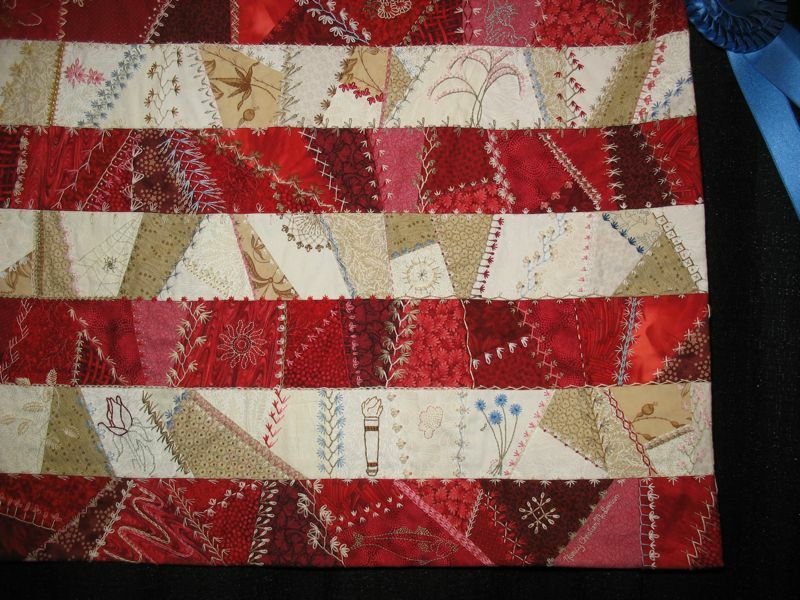 A crazy-quilt version of the flag. This is a new idea as well, as most depictions are traditionally pieced. 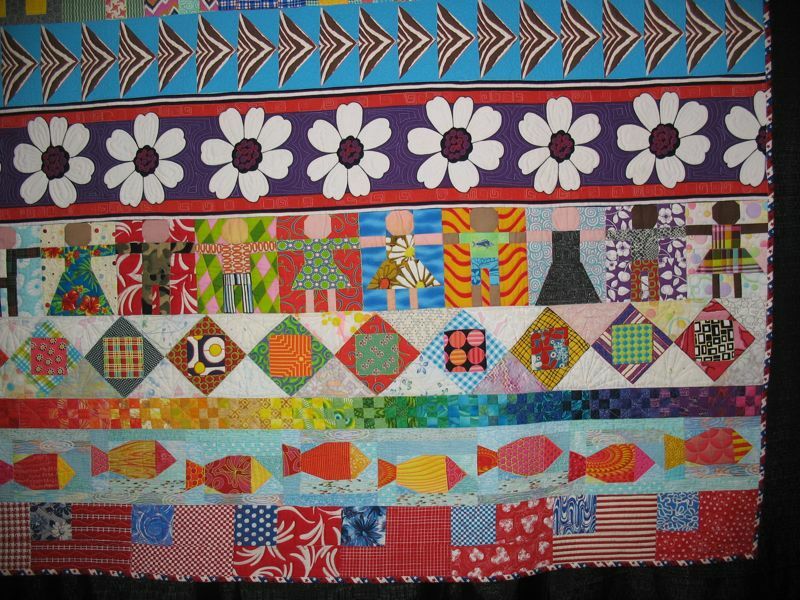 Nostalgic fabrics, reproductions of designs from earlier days, are used in a quilt that makes a statement against handgun violence. Enjoy these for now. I’ll try to get a few more posted later.